I have a confession to make--I haven't read the book Seth Grahame-Smith is famous for: Pride and Prejudice and Zombies. I love zombies; Jane Austen not so much (I read Pride and Prejudice twice, hoping I might like it more the second time, so I'm not exactly eager to waste more time on it even with the inclusion of the walking dead). The good thing about being unfamiliar with Grahame-Smith's work is that I'm unfamiliar with his work. I came to Abraham Lincoln: Vampire Hunter with a clean slate on the author's MO and abilities. The basic premise of the book is that Abraham Lincoln, sixteenth president of the United States, spent nearly his entire life under the fangs (so to speak) of vampires. From his childhood when he discovered his beloved mother had been killed by a vampire loanshark (rather than by "Milk Sickness" as is commonly thought) to the very last days of his presidency, Lincoln was never free of vampires. I have to say, I enjoyed reading about Lincoln's life. I'm a fan of history, but I don't know much about American history. I'd like to read more about Lincoln now and see how Grahame-Smith's story meshes with Lincoln's own. I did check a couple of the facts and they were accurate (or accurate enough), and could conceivably involve vampires. Grahame-Smith clearly knew what he was doing when he chose Lincoln of all the presidents. I also have to give props to the cover design: a fairly sedate picture of Lincoln rendered in black and white with splashes of red. It takes a second to notice the "splashes" are bloody hand- and foot-prints, and that Abe is holding an axe behind his back. That's the front cover. When you turn the book over, you get the back view of the same scene, complete with severed vampire head being clutched in Lincoln's hand. Nice. That being said, there were a few weak spots. I wasn't thrilled that the author included himself at the beginning of the book, claiming a vampire gave him Lincoln's lost journals and told him to write a book about them. The vampire who gave him the journals also included a list of eleven people--the only people with whom Grahame-Smith was "allowed" to discuss the contents of the journals. First of all, if he was supposed to write and publish a book about the journals, why was he limited to talking about them to only a handful of people? Second of all, the subplot with the eleven people goes absolutely nowhere. It would have been better not to mention them at all. I also had a problem suspending my disbelief throughout the book. Yes, a lot of what happened could have been attributed to vampires, but I kept asking why vampires would do those things. One example is Lincoln's mother's death. The vampire who killed her was owed money by Lincoln's father, who couldn't repay him. So the vampire decided to take his payment in other ways. Sounds reasonable, right? But instead of feeding on Lincoln's mother, the vamp gave her just enough of his blood to sicken and kill her. He did the same with her aunt and uncle, whom Lincoln's father didn't even care about. If I was a vampire out for revenge, I'd make the wife and kids my meal, not spill my own blood to kill the wife and her inconsequential relatives. There were lots of illogical bits along those lines. Of everything, though, I had the biggest problem with the ending. Predictable and bordering on cheesy; it just wasn't good. It might also have been a smart idea to bring Grahame-Smith back into it at that point, to offer a bit of an epilogue after he's done with the journals. Is Abraham Lincoln: Vampire Hunter the best vampire book you'll ever read? Probably not, but it's nowhere near the worst, either. Is it the best book on Lincoln you'll ever read? Well, I have no idea about that, but if you're a history buff you'll probably get a kick out of it. Overall, it was an enjoyable read, well-paced, and decently written. Unlike so many books I've read, it left me wanting more. At the very least, you'll get a whole new appreciation for Honest Abe. If you're interested in seeing the Abraham Lincoln: Vampire Hunter trailer, click here. Appearance: Extremely pale humans, usually wearing dark glasses and carrying umbrellas/parasols. When the vampire emerges, their eyes turn completely black and long fangs and claws descend. Strengths: Ability to read minds/recognize the destiny of humans. Super strength, speed, hearing and sense of smell. Can climb buildings vertically. Can jump long distances. Older vampires can withstand the sun. Very old vampires can turn a human who's been dead for a few weeks. Weaknesses: Axes, stakes, fire, bullets, starvation. Sunlight (young/new vampires). Mythology and Vampire Culture: A small amount of vampire blood given to a human will make them suffer as though they're being transformed, but will ultimately kill them. To turn a human, an ample amount of vampire blood needs to be given; the human then undergoes pain, fever, and hallucinations before finally becoming a vampire. Some vampires see humans as cattle and treat them accordingly. Others want to keep the natural order, where vampires have superior strength, but humans have superior numbers. These vampires want humanity to thrive, and only feed when necessary. Abraham Lincoln: Why haven't you killed me! Henry Sturges: Some people, Abraham, are just too interesting to kill. 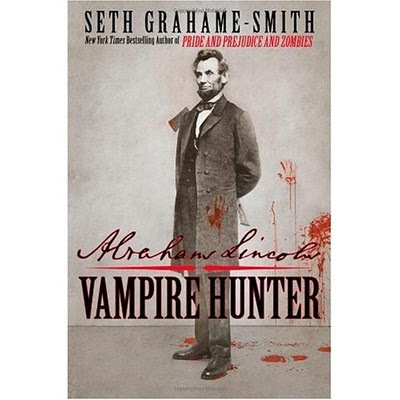 Abraham Lincoln: Vampire Hunter by Seth Grahame-Smith. From Grand Central Publishing. Also available as an e-book. Wow--thank you! Keep an eye out for my upcoming post on this.